What is the most creative way to explain civil engineering? Pitch 200, the engineering competition with a difference, brings together civil engineers to answer that exciting question. 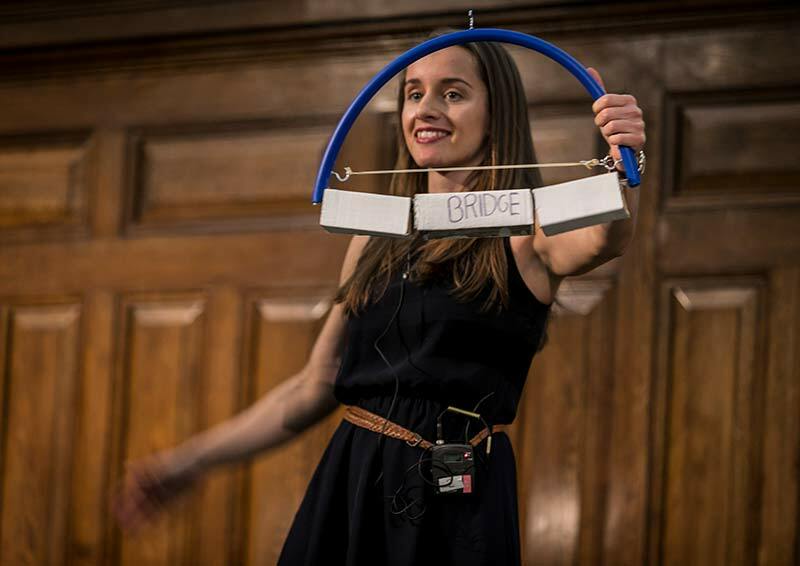 See the region’s creativity come alive with engineers showcasing their work in the most curious and unconventional way at the ICE London and South East England, Pitch 200 Regional heat. From across the region, the top entries selected by expert judges will compete to showcase their talent and creativity in 200 second presentation using all sorts of props and methods. The winner will become the ICE Regional Ambassador for 2020 and will go on to represent London and South East England at the national final in Autumn 2019. Presentations will be followed by question and answer sessions where the audience is encouraged to participate. This year’s guest host is Brittany Harris, CEO and co-founder of Qualis Flow and ICE superhero ‘Water Woman’. Join us at Pitch 200 for a free, fun and informative evening. Test the finalists’ knowledge and learn about the variety of things civil engineers do. Aaron Matthew is a civil engineer with Turner & Townsend working at Heathrow to improve customer experience. He was chosen as a Future Leader in 2015 by Sir John Armitt and has since been heavily involved with the Institution of Civil Engineers. With the London team he set up Pitch 200 which aims to show the world how interesting engineers really are. After five years in the construction sector Debbie decided to set up her own marketing and business development company – Jooce Marketing & PR Ltd, which fulfilled a life-long dream of Debbie’s to be self-employed. Jooce was founded in 2007 and provides marketing and business development support to UK-based construction companies and boasts a strong portfolio of client’s operating predominantly in the geotechnical sector, including two industry leading geotechnical membership organisations – The Federation of Piling Specialists (FPS) and the British Drilling Association (BDA). Debbie prides herself on helping her clients win business and raise their profile within the construction sector. Debbie also sits on the Ground Engineering magazine Editorial Board and is passionate about promoting women in construction. Dr Juan Sagaseta is a Senior Lecturer in Structural Engineering at the University of Surrey. He is currently involved in research on structural robustness and the development of innovative forms of construction using steel-concrete solutions. He was awarded the fib Achievement Award (research category) in 2011, based on his Doctoral Thesis for the scientific and technical contributions in the area of structural concrete. In 2012, he received the Magazine of Concrete Research Award (ICE publishing) for best paper of the year. In 2013-2014 he was the principal investigator in a EPSRC project on the structural performance of flat slab-column connections under impact and blast loading. Shireen Ali-Khan was recently appointed by education focused agency leading on STEAM activity, bringing with her a wealth of knowledge and experience from her l5 years in the engineering industry focusing on innovation and change management. Her passion and expertise are deeply rooted in her desire to provide a high-quality learner journey, encouraging young people into science and engineering careers and leading on change within business. Shireen has previously worked in Rail, Construction, Aviation, Cyber Security, Impact and Higher Education, proudly demonstrating her experience within engineering engagement, innovation and change management. She has led such programmes for companies including; TfL, Crossrail, HS2, Tideway, The Royal Academy of Engineering and the Institution of Engineering & Technology.